The O’Briens had an extraordinary history stretching back to the 5th Century, Dromoland Castle was originally the ancestral home of one of the few families of Gaelic Royalty; direct descendants of Brian Boru, the High King of Ireland. We first hear Of Dromoland in about 1551. There were at least three houses here, at various times, called Dromoland. They were inhabited by eight generations of the O’Brien family. According to the historian James Frost, Dromoland translates as the “Hill of Litigation.” In 1582 Donough was hanged in Limerick on charges of rebellion. The government decided that all his property would be forfeited to the Queen. Sir George Cusack, the sheriff, took possession of Dromoland. Some years later, Turlough O’Brien killed Cusack and various O’Briens attempted to re-possess Dromoland. The fourth Earl of Thomond claimed to have sole ownership and tried to exclude Donough’s son, Conor MacDonough O’Brien. The outcome of this dispute is unclear. The O’Briens lost possession in the mid 1600s. They were uniformly denominated Kings of Thomond, until Murrogh O’Brien surrendered the sovereignty to Henry VIII. The Earls of Thomond owned: extensive estates in Counties Clare, Limerick, Tipperary Carlow, Queen’s County,2 Dublin and Meath. After the Restoration of Charles II in 1660, the Earl of Thomond retained substantial interests in England and he, and his descendants after him, became absentee landlords, residing at Great Billing in Northamptonshire, England. Sir Arthur Young revealed that Henry O’Brien (An absentee landlord) was drawing £6,000 from his Irish Estates in the late 1700s. 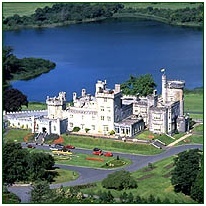 They maintained a residence in Dromoland until 1962 when due to difficult circumstances; the 16th baron was financially compelled to sell the Castle and the remaining 375 acres.